The Hoopoe is a medium sized bird, 25–32 cm (9.8-12.6 in) long, with a 44–48 cm (17.3-19 in) wingspan weighing 46-89 g (1.6-3.1 oz). The species is highly distinctive, with a long, thin tapering bill that is black with a fawn base. The strengthened musculature of the head allows the bill to be opened when probing inside the soil. The hoopoe has broad and rounded wings capable of strong flight. 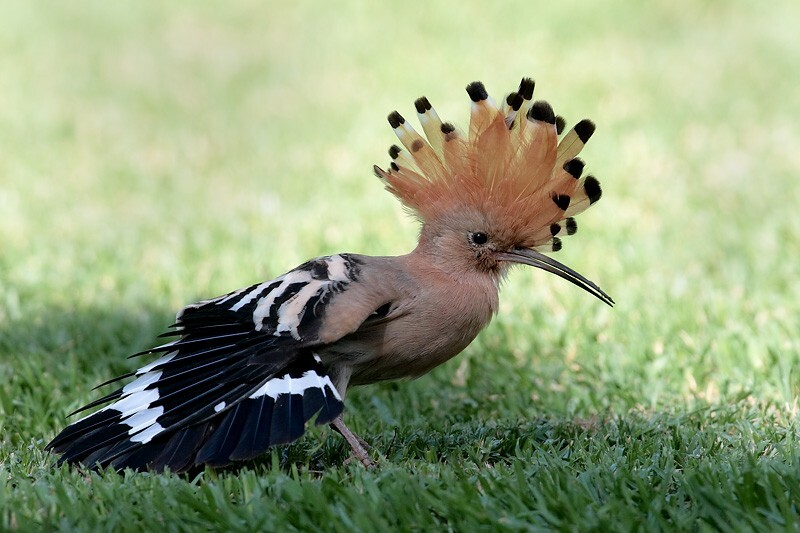 The Hoopoe has a characteristic undulating flight, which is like that of a giant butterfly, caused by the wings half closing at the end of each beat or short sequence of beats. 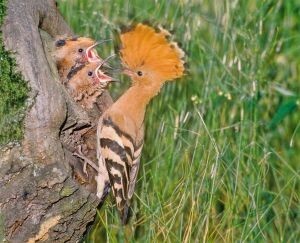 The Hoopoe has two basic requirements in its habitat; bare or lightly vegetated ground on which to forage and vertical surfaces with cavities (such as trees, cliffs or even walls, nestboxes, haystacks, and abandoned burrows) in which to nest. These requirements can be provided in a wide range of ecosystems and as a consequence they inhabit a wide range of habitats from heathland, wooded steppes, savannas and grasslands, as well as glades inside forests. The modification of natural habitats by humans for various agricultural purposes has led to them becoming common in olive groves, orchards, vineyards, parkland and farmland, although they are less common and declining in intensively farmed areas. The song is a trisyllabic "oop-oop-oop", which gives rise to its English and scientific names. 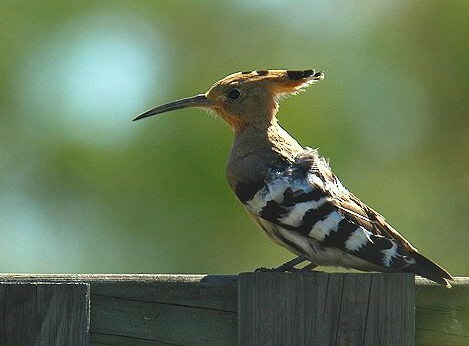 In what was long thought to be a defensive posture, Hoopoes sunbathe by spreading out their wings and tail low against the ground and tilting their head up; they often fold their wings and preen halfway through. The Hoopoe also enjoys taking dust and sand baths. The Hoopoe is monogamous, although the pair bond apparently only lasts for a single season. They are also territorial, with the male calling frequently to advertise his ownership of the territory. Chases and fights between rival males (and sometimes females) are common and can be brutal. Birds will try to stab rivals with their bills, and individuals are occasionally blinded in fights. The nest is in a hole in a tree or wall, with a narrow entrance; it may be unlined or various scraps may be collected. The female alone is responsible for incubating the eggs. Clutch size varies with location, with northern hemisphere birds laying more eggs than those in the southern hemisphere and birds in higher latitudes having larger clutches than those closer to the equator. In central and northern Europe and Asia the clutch size is around 12, whereas it is between four in the tropics and seven in the subtropics. The eggs are round and milky blue on laying but quickly discolour in the increasingly dirty nest. They weigh 4.5 grams. The Hoopes have well developed anti-predators defences in the nest. The uropygial gland of the incubating and brooding female is quickly modified to produce a foul-smelling liquid, and the glands of nestlings do so was well. These secretions are rubbed into the plumage. The secretion, which smells like rotting meat, is thought to help deter predators, as well as deter parasites and possibly act as an antibacterial agent. The secretions stop soon before the young leave the nest. In addition to this secretion nestlings are able to direct streams of faeces at nest intruders from the age of six days, and will also hiss at intruders in a snake like fashion. The young also strike with their bill or with one wing.